Please allow 2 weeks for shipping and handling. Shade Details: 5.5" x 8" x 12.25"
Composed of natural quartz stone, alabaster bases or black cremo marble, this architectural and raw fixture channels affinity for clever mixology and natural materiality. Graceful yet edgy, its subtle refinement and soulful sense of cool adds spirit and dimension to any space. Composed of a hand-selected solid natural quartz stone and sculptural brass base, this architectural and raw fixture channels Kelly’s trademark affinity for clever mixology and natural materiality. Graceful yet edgy, its subtle refinement and soulful sense of cool adds spirit and dimension to any space. Composed of hand-selected solid natural quartz stones and a sculptural brass frame, this architectural and raw fixture channels Kelly’s trademark affinity for clever mixology and natural materiality. Graceful yet edgy, its subtle refinement and soulful sense of cool adds spirit and dimension to any space. Composed of a hand-selected solid natural quartz stone and sculptural brass base, this architectural and raw fixture channels Kelly’s trademark affinity for clever mixology and natural materiality. Graceful yet edgy, its subtle refinement and soulful sense of cool adds spirit and dimension to any space. 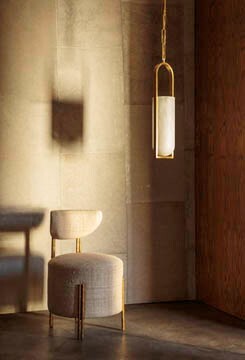 Available in Natural Quartz and Brass with Brass Shade.